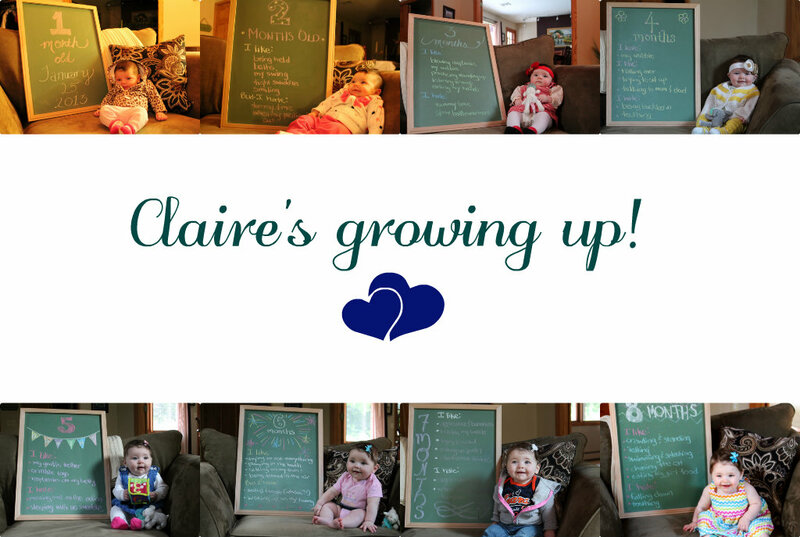 I do deClaire: Claire is 8 months! Well I went and named my blog after her, I can't really get away with not doing a monthly update! Claire Bear (as she is known by) has been crawling since early August and started sitting herself up from laying down and pulling herself to standing within a week after that. She's got a bottom tooth coming through now, too! Claire is an absolute flirt and loves attention from everyone. Even though she didn't seem to like solids when we starts just over 2 months ago, she loves everything now (although she wasn't too much a fan of avocado) and tries to get to our food when we are eating. I love listening to her 'sing' to herself and babble (partly the mom and partly the speech pathologist in me!). She is too cute! I love this way of documenting a baby's growth. What a cutie! I love the last pose. Such a cute idea. Thanks for your visit and brightening my DAY! Too cute! Happy 8 months Claire! This is adorable. Oh my gosh, what a cute idea. She is beautiful!!! Love the third down pic where she is partly crawling off...it looks like she is trying to be sneaky! So cute!! She is so cute, Laura! Yeah for good eating, it makes life so much easier. Thank you! It's been fun seeing how her likes and dislikes change each month! It will be nice to look back at when she is older. She's so curious, she loves to get in to everything! Thank you Ginny! I just hope she continues to be a good eater! Thank you Susan! Her hair is so long in front, we have to clip it back otherwise it's in her eyes! We think she's pretty cute, too! ;) My mother-in-law is an amazing seamstress and made that dress for her!